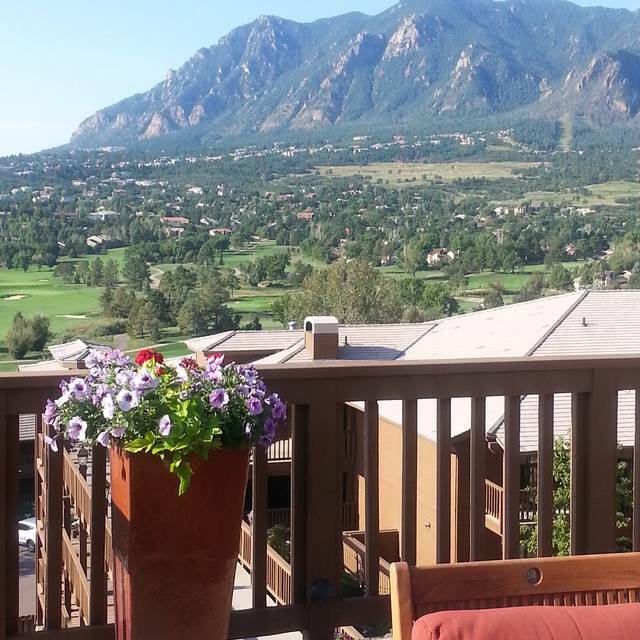 Complimentary valet parking is available at the Cheyenne Mountain Resort main entrance. Self-parking is also available in our public lots. All private parties over 30 people may contact Catering directly at 719.538.4007. 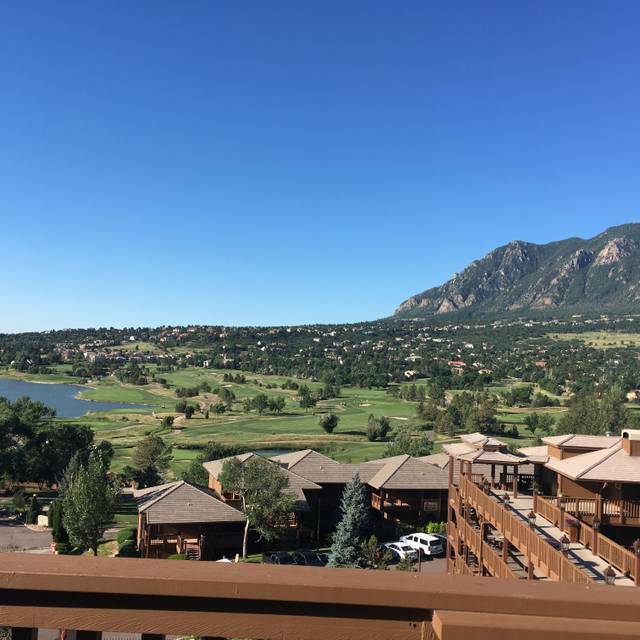 The Mountain View Restaurant offers two private dining rooms with spectacular views of Cheyenne Mountain, the Country Club of Colorado and our signature 18-hole Pete Dye designed golf course. The rooms, known as Remington's I and II, comfortably seat up to 75 guests each. Remington's I also boasts its own gas-burning fireplace, which sets the perfect mood for your important event. Room rental fees may apply. 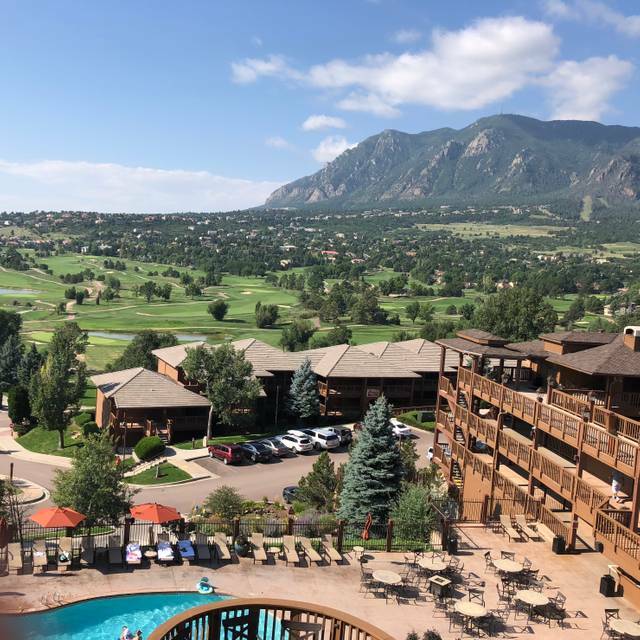 Cheyenne Mountain Colorado Springs, A Dolce Resort's signature dining establishment, Mountain View Restaurant, features high wood-beamed ceilings, soothing natural light and an outdoor terrace with sweeping views of the nearby mountains. 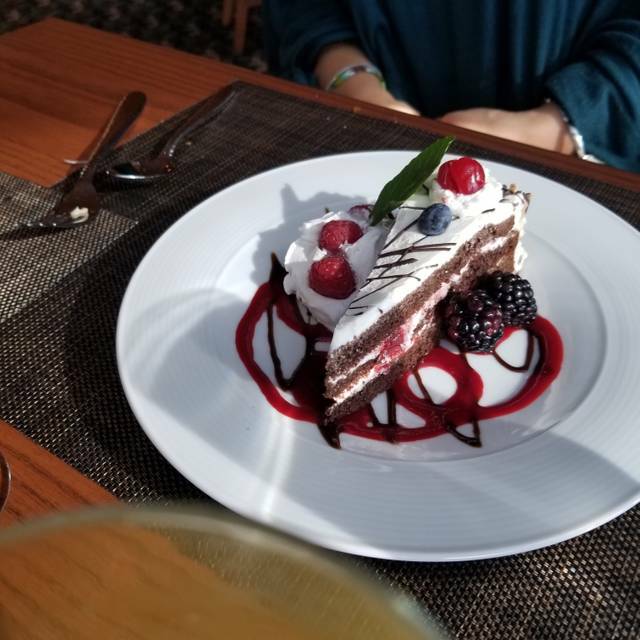 The restaurant is locally renowned for its sumptuous breakfast, lunch, dinner, and Sunday Brunch buffets that offer an elegant array of savory dishes and decadent desserts. 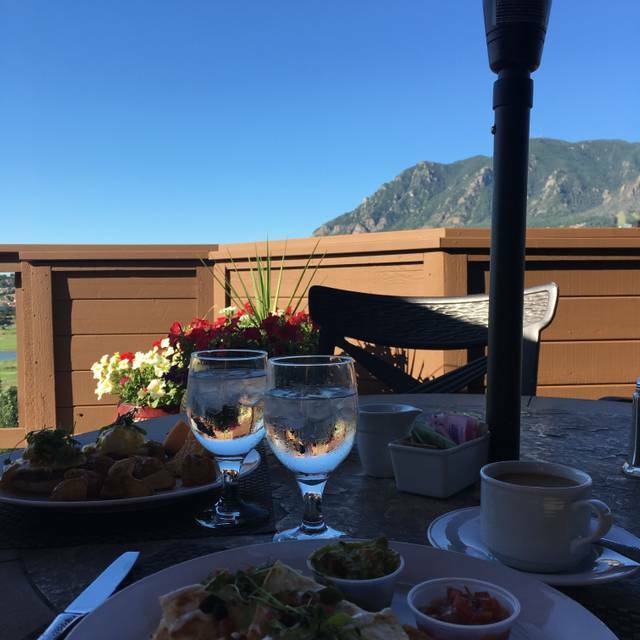 Our culinary team demonstrates its skill and creativity by blending local Rocky Mountain ingredients and wild game with global cooking styles in a unique Colorado Fresh experience. 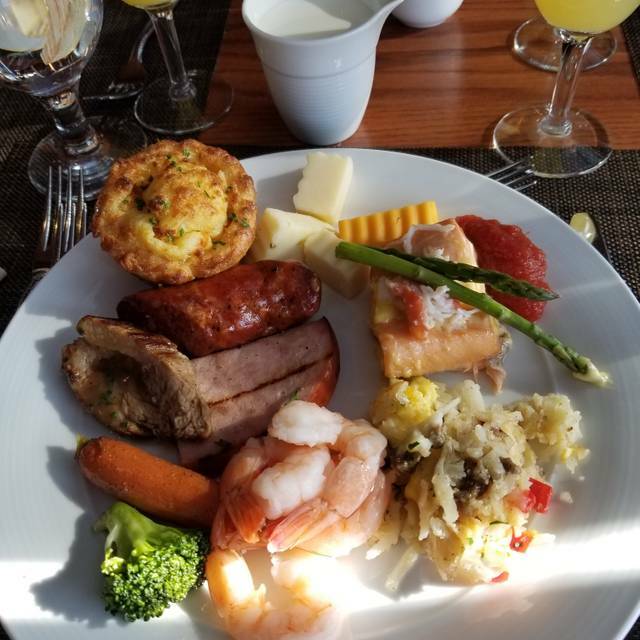 Excellent breakfast buffet! Wonderful and unique selections with an amazing omelette bar! It appeared as if the staff was new or brought in just for this day (Valentines Day). The hostess wasn’t sure about the table numbering and the wait staff appeared to be rushed all the time. We also had to send our food back because it had cooled down by the time we received it. We even got a call on the way home about a waiter forgetting to put the entree on the bill thinking it was our table, but we paid the full price. It was ok but the lighting was glaring bright, the table they sat the two of us at was barely wide enough for the placemat, and the help we straight out of waffle house. The food was good. Enjoyed our meal on Valentine's Day. Hope to come back sometime when the regular menu is available. Ron was our waiter both nights and he did a great job making sure we understood the menu and all our options with the salad bar. The food is average, nothing to write home about. Food is pricey but the view is fabulous. The greeter was not friendly. She insisted there was no buffet, but there was clearly a lunch buffet. She was reluctant to give us menus, but gave one menu for the 3 of us. Very weird. The buffet itself was pretty good, but only 2 meats - chicken and pork. They were pretty generous with the champagne. I would probably not go back. The greeter and unfriendly vibe would make me not go back. We had been here for breakfast before, always on weekends and it was good but mid week breakfast was very lacking. Our plan was to take our parents out for a nice breakfast, enjoy the buffet, and the views and take a few family photos on the deck. We were all looking forward to it. However, when we arrived, the buffet was not out, and the deck was closed off. I inquired about it and was told that they decided not to do it that day because of occupancy levels. I think that it would have been appropriate for the staff to call people with reservations to let them know this ahead of time. If we had been provided this courtesy, we would have rescheduled. We ordered off the menu, and despite the largely empty restaurant, the service was quite slow. To top that off, one in our party found a hair in his omelet. The staff did offer to have a new one made, and we were provided a discount on our bill. Overall, it was a disappointing experience with regard to service and food options. My wife was very unsatisfied with her fish, as it had no seasoning or flavor. Service was slow for being almost the only people dining. The menu was far too limited and there was no indication of this when I made the reservation for my wife's birthday. So the outing was far too expensive for the poor food and slow service. We asked for window table but they were too lazy to accommodate. Made excuse that we had too many people in our party when in fact there were tables available. Always a treat, this was our annual Christmas brunch. The food was excellent, the venue very nice, the seating comfortable but not overcrowded. The buffet choices were quite good if a bit fancier than I'd really wanted, but I was able to gorge myself quite effectively! Two things missing: I could find no bread at all (rolls, bread for a toaster, etc.) and the only eggs were made directly on the grill. While that was possible in theory, in practice the deep lines made that impossible. It would be wise to put a bread station back in the periphery of the buffet area, and to keep some scrambled eggs and hot and waiting throughout. But these are small things on balance. We've enjoyed this place for years; we'll do it again next year. Quality of the food was inconsistent & primarily mediocre for the cost. I will not choose the buffet again. New ownership raised the lunch buffet cost to an unreasonable level -- almost double from one year ago. Not at all acceptable and I won't be going there again; the food and ambiance is just not worth the cost of a buffet. Really disappointed in the Mountain View. We made reservations for Saturday night (15 Dec). Apparently, they're only doing a buffet on weekend nights during one of the busiest times of the year -- no menu was available. The buffet was serviceable enough. Not great; not bad either. Fortunately, all of the staff was wonderful. 1. They mixed in regular diners with a Lockheed Martin Christmas party. Really super awkward. There wasn't another room available or a section of the dining area which could have been reserved??? 2. The bill for the buffet and two drinks was over $150?! Which is ridiculous considering half of the buffet is just really simple dishes made to look fancy. Moreover, the preparation wasn't that great. There was a gnocchi dish for example which was dripping in cream sauce the consistency of paper machie. The only reason it moved at all was the sauce broke and the butter was separating from the cream. So... nice service. Thank-you for that. But Applebee's food at Broadmoor prices in a really uncomfortable setting. I will probably never eat here again. Please treat solo diners with more courtesy. Excellent service and great food in an always stellar environment. Always enjoyable! Never got a chance to eat as after over two weeks of planning for our special 32nd anniversary dinner, and a confirmation of the reservation, we arrived to find they were only serving their holiday buffet at $59 a piece. Never let us know until then. How’s that for customer service. Very disappointing. It was not busy and we were one of just a few tables at lunch. Christmas luncheon for three other women. Had breakfast for a party of 8 the day after Thanksgiving. The service was very professional and prompt, and food was top notch. Lots of hot and cold choices on the buffet, and made to order waffles and fluffy delicious omelettes. FYI, kids under 6 can eat from the buffet for free, so you don't have to order off the kids menu. The wait staff is very friendly, attentive, and they ensure that you will always have a fresh beverage. We enjoyed our experience however, think it is overpriced. The buffet, which we've patronized for years, never have batted an eye with price increases, which is necessary, but will not return. Outside of a small seafood section, shrimp and oysters, it was just breakfast items basically. Even salad area, lower food cost,was bare bones. Desserts, also! Nice room, friendly service and good quality food. Nice quite dining room, well laid out and not crowded. Had the buffet, full meal and order of ravioli. All nicely done. Wine selection was a bit sparse. Red wine glasses need to be larger to add to the wine experience and to the presentation. Also need to invest in a couple of wine decanters. Overall good experience. Very friendly wait staff. Beautiful view. Food was very good. We really enjoy the brunch at Mountain View. The food is always varied and delicious and the service is outstanding. The view from the dining room is beautiful. Pretty disappointing. The pictures make it look like a "fun lunch out" - not so much. Essentially the equivalent of Chili's with a slightly better view. Very enjoyable late brunch with family and friends. Views are amazing. Attentive wait staff and delicious food to fit all tastes. Was staying here on vacation so we ended up eating here with some travel companions the first night. Seems like they would rather have you eat off the buffet instead of ordering ala carte since the orders took a long time to arrive. Perhaps the kitchen is just not at full swing for orders and more focused on buffet refills. Food was ok, but the prices?! Way too high. I’ve been visiting this hotel for over 10 years. Last year they were in the middle of transition. This year the quality of the food was horrendous. Cold food. Not cooked properly. Over cooked waffle fries. Use to love having breakfast and at least one large dinner party there. Wouldn’t do it. Amazing views of the mountain! Great food specifically the brisket grilled cheese & service was wonderful. Overall great lunch experience. My husband and I came here to see the view. We had seen pictures and really wanted to see it for ourselves. The food was okay. We started with cocktails and then ordered the truffle fries and shrimp cocktail. The truffle fries were good, a little greasy but not bad. Shrimp cocktail is shrimp cocktail. I ordered the Wild Mushroom ravioli as my meal, my husband ordered the filet Mignon. The food wasn’t anything remarkable. There isn’t really anything drawing is back to the restaurant. We moved from Dallas at the end of April, where we had endless amounts of nice, good quality restaurants to choose from. Still trying to find “our” place here in the Springs. Host was not friendly. Waitress asked if we knew what we wanted to order as we were being sat at our table. Took 30 minutes to receive our appetizer. Our salads came out with our meal. Never received my after dinner coffee. Gentleman seated next to us complained the whole time. Girl seated on the otherside of us talked on her phone FaceTiming with the speaker on the whole dinner. Steak was delicious. Best part of meal. The host was an inept young man who appeared confused that we were early. I told him my name but he still marked me as a 'no-show' reservation! The waitress however was professional, polite, attentive. She was apologetic when she informed us that they ran out of a main menu item. The replacement however was excellent. Not happy about being marked as a no- show though. Sunday Brunch was great but toast and hashbrowns would of made it better. Made reservations after reviewing menu. After we arrived, they informed us it was a buffet only. Very disappointing.